Neil Braidwood and springer spaniel Ruby try the growing sport of canicross, and haven’t looked back. 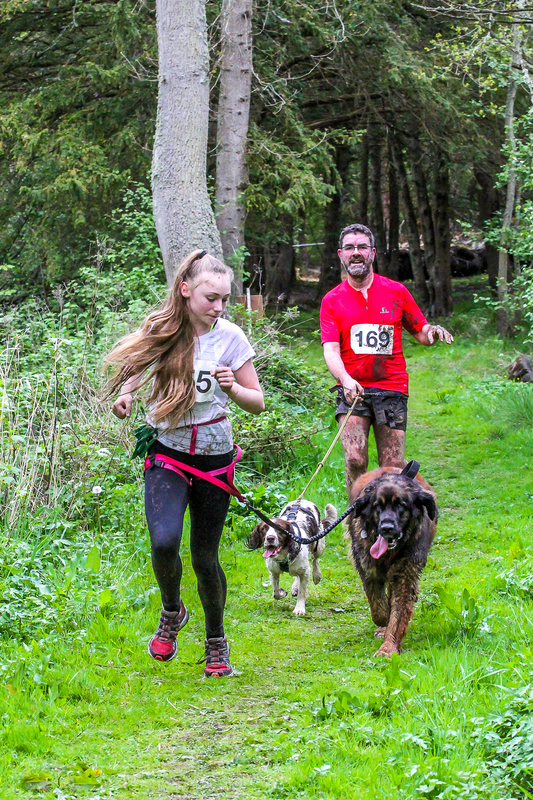 CANICROSS, or the sport of running off-road with your dog attached, is on the rise in the UK. 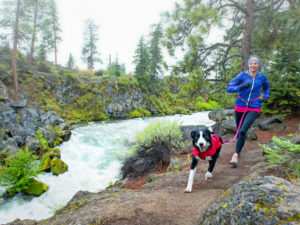 With around a third of households owning one or more dogs, the appeal of getting fit yourself while exercising your pooch has never been greater. The sport of canicross originated in Norway as off-season training for sled dogs and has grown in popularity in the UK since 2000. I am not a keen runner, and the idea of pounding pavements and dodging pedestrians has never appealed to me. However, I discovered canicross at a ‘come-and-try’ session at Vogrie Country Park, as part of Midlothian Walking Festival. Cani-Sports Edinburgh, my local club as it turns out, were lending equipment to keen participants who wanted a taster of this popular sport. 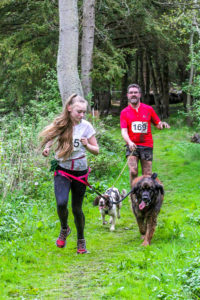 Many people ‘free run’ with their dogs (ie: off lead), but as one of the organisers Andy Kinnaird explained “we attach ourselves with a special harness to the dog, and run as a unit. Your pet pulls you along, and you form a lasting bond with your dog, because you work as a team”. The harnesses looked fairly complicated, the human one having loops around the legs to stop it riding up, and the doggy ones varying from simple step throughs to elaborate buckled versions for escapologists. The connection from human to dog is via an elasticated bungee lead, to act as a shock absorber. This allows you and your dog to run without any sudden jerking movements. Because the dogs can pull so hard, the pressure needs to be distributed across the shoulders of the dog, so a purpose made harness is recommended. Off-road is also best, as the dogs need traction from their front legs to pull. My Springer Spaniel Ruby was keen to get into the harness and meet the other dogs of all shapes and sizes that had turned up for the session. There were Labradors, Border terriers and Collies. Andy explained that some dogs take to the sport better than others, but there is no restriction on the type of dog you have. Nor is there any restriction on how fit you need to be as a runner. People get into the activity for all sorts of reasons – not all of them want to break a world record – with many more interested in that bond between human and dog. Another great reason is to socialise your pet with the other dogs, so the sport is useful for rescue dogs or dogs that have difficulty integrating. I was confident Ruby would be good at pulling me along – she almost pulls my arm out of my socket when we are heading to the park. Having the pulling coming from the waist belt is great though, as your core is much stronger, and you are able to control the dog from there. Your dog does need to be more than one year old, and it does help if they can obey certain commands – “steady” is a good one when going downhill, while “left, left” or “right, right” can be useful when negotiating turns, but not altogether essential. Courtesy on the trail is also important. You should make way for walkers and of course always pick up after your dog. Heat is the last piece of the puzzle, as it can be dangerous to run your dog on days when it is too hot. They can overheat easily so water stops are important along the way, and the club runs tend to start early in the mornings during the summer. 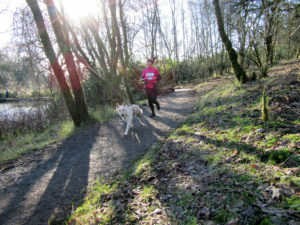 For that reason, the main season for canicross is the winter, and that’s when most of the events and races take place. Back to our taster session, and newbie runners were buddied up with club members, we didn’t get lost in the extensive woodland. Ruby took to running with the harness quite well, although she started by trotting beside me, and I had to take up the slack on the lead to avoid tripping. However, when another dog headed out in front, Ruby was keen to catch it, and that’s when I felt the power of the pooch – she became turbocharged and I felt I was running much faster than normal. The run was over almost as soon as it started – we just did a 1km loop to give people an idea of what was involved. I certainly felt I could have gone on longer, and Ruby too, looked hungry for more. I went back for the regular Saturday morning run (5k) and enjoyed it all so much, I joined the club and now even have my own kit! Operated as a members’ club, rather than a business, Cani-Sports Edinburgh has a committee and run their own events as part of the wider canicross community across Scotland. 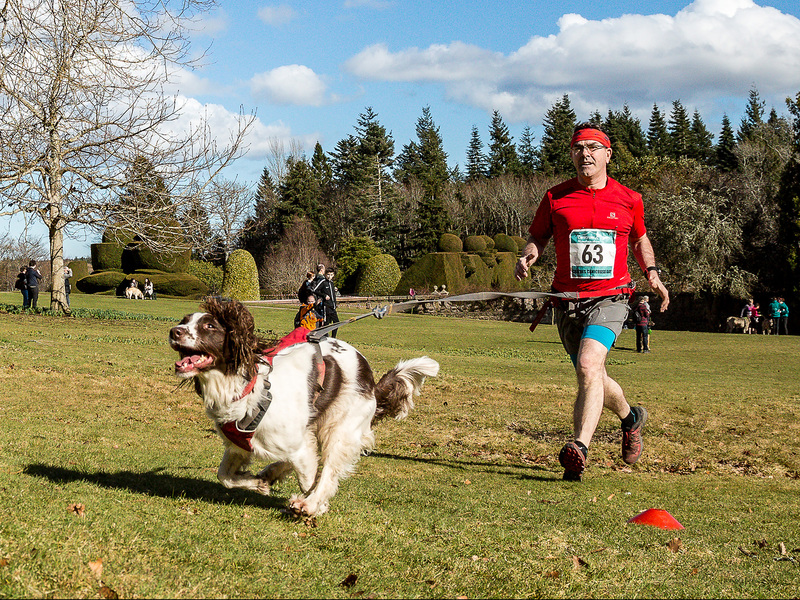 As a reluctant runner, I even entered an event – the Ruff Dugger – part of Cani-Fit Scotland’s extensive events calendar. But that’s another story! This article first appeared in the September/October 2016 issue of Scotland Outdoors magazine. Neil is now on the committee of Cani-Sports Edinburgh and helps to organise the Saturday morning runs. Obviously, you’ll need a dog that is healthy, but you will need some other specialised equipment to make the experience a good one. Find a local club. The central belt of Scotland is well served, and there is a club in the Inverness area. Visit these websites for help and ideas. A pair of decent running shoes or trainers will help you keep upright on the muddy trails. There are loads of specialist trail running shoes on the market such as the Mudclaw by Innov8 or Merrell’s Tough Mudder footwear. The main difference with shoes like these is that they have deep lugs in the soles or drainage holes to let water out.